Sheffield Wednesday football clubs nickname of "The Owls" came about because of the area that their ground is situated in - Owlerton. The most obvious reason is a shortening of the districts name down to Owl, then again there is also those who believe that the nicknames origins were to do with the fact that there were lots of owls in Owlerton !! Another little known, and often refuted fact about Wednesdays nickname is that in the 19th century it used to be "The Blades", of course this is now the nickname of their neighbours - no wonder their fans deny it !! 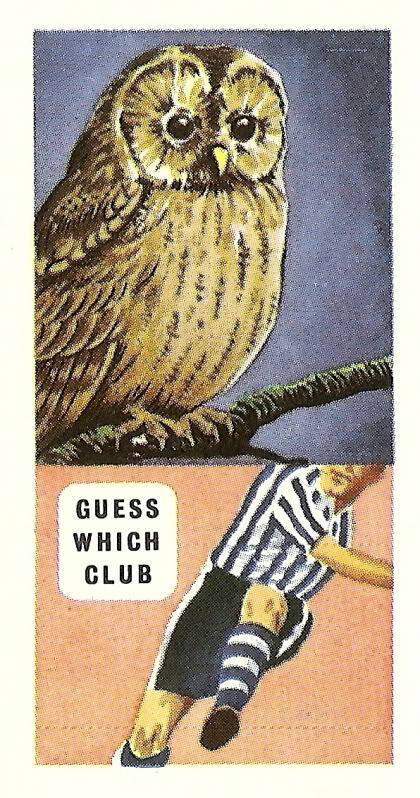 We've shown below a couple of cigarette cards that depict the football clubs accepted "Owls" nickname in caricature form. "The Owls. The nickname "Owls" has been associated with this club for many years and is accepted as being derived from the district in which the ground is situated, now known as Hillsborough but originally known as Owlerton." 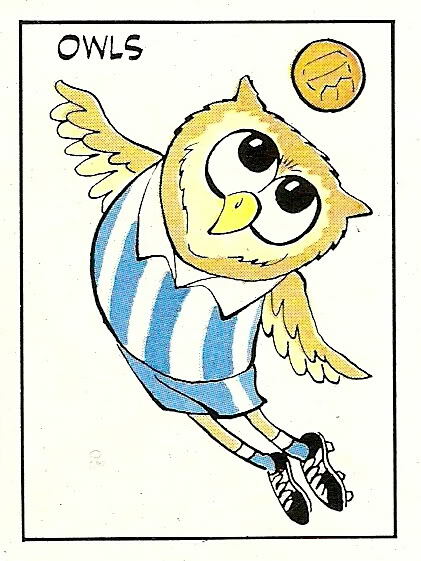 "Sheffield Wednesdays fine ground at Hillsborough was formerly in the Owlerton postal area, hence the nickname, the "Owls," - for illustrative purposes the club is still depicted as an Owl. They first competed for the Cup in 1878, and in a long and distinguished career they have two victories to their credit. In addition they have carried off the Championship of the League on four occassions, winning twice in in succession, in 1903-4 and in 1929-30. Sir Charles Clegg, the president of the Football Association, has been a leading official of the club for many years." 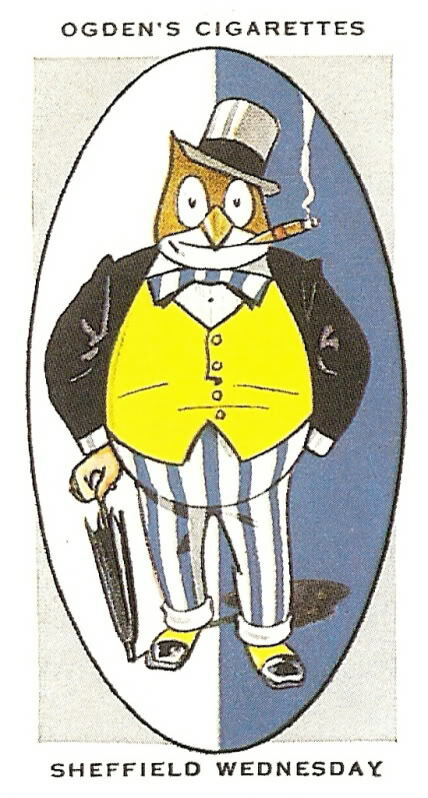 The cartoon above is Paninis take on the Sheff Wed football nickname, this character was part of the Panini 86 sticker series. Again, this sticker can be purchased on our Footybits site where it has been mounted in a clear fridge magnet.